Weather Watchers follow the progress of storms for another season. [+4] - engineer - 10/10/2018Good luck to those in the Florida panhandle. The roof get's patched today, just in time. [+3] - glitterbag - 09/10/2018One other tip, lower the brightness on your cell phone and iPad, it will stay powered up longer. [+3] - JPB - 09/13/2018Will be checking here for your updates as you are able to provide them. Be safe. Check in when you can. [+3] - engineer - 09/13/2018Will do, thanks. Not sure when the power will go out, but sure that it will sometime so updates might be limited. 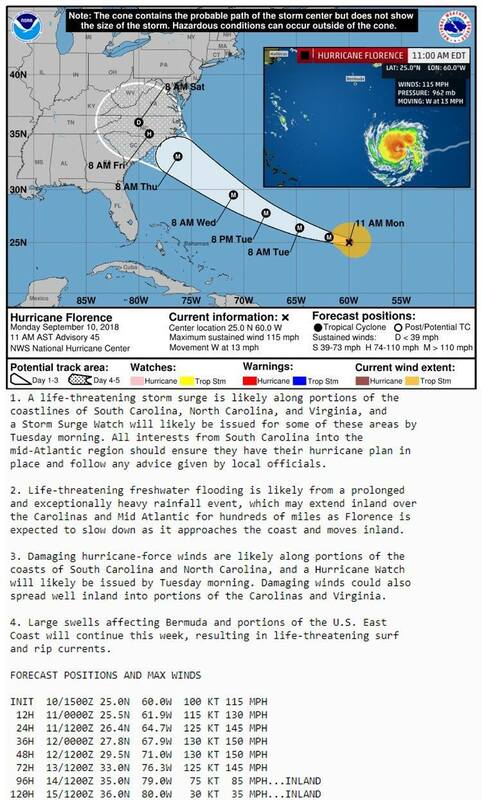 Beryl is already a hurricane as of Saturday, July 7th. She could affect Haiti, Puerto Rico etc by Tuesday. We visited St. Maarten in February. It was destroyed from the storms the previous year. Very sad to see. Puerto Rico can't seem to catch a break. Are there any A2kers in Hawaii? The storm named Lane looks evil as it takes aim on Hawaii. CI visits Hawaii fairly often. He has a sister and a few other relatives living on one of the Islands. GORDON poised to come ashore between Western Florida and Louisiana sometime tonight. The biggest threats are from rain, rain and rain. Hurricane Florence. Be aware Carolinas. Florida has you in our thoughts. Looks like I'm right at ground zero here and might be looking at close to Cat.5. As of 11 a.m., Monday, Florence was tracking west at 13 mph. Its peak winds were 135 mph, making it a Category 3 hurricane. The Hurricane Center predicts it will reach Category 4 intensity by Tuesday and maintain that intensity through landfall. It is not out of the question that Florence could become a Category 5 hurricane at some point. The official Hurricane Center forecast suggests its peak winds will reach 150 mph winds between Tuesday and Wednesday, just 7 mph below Category 5. We're talking about that now. Might be Mrs. Engineer takes the kids inland and I stay with the house and the dog (who is not travel friendly). Not sure how good Raleigh will be either. After we get hit, they are next. There was a brief interview on NPR this evening with your mayor. Please reconsider the idea of staying in Wilmington. Florence is a big ugly girl. Keep a close eye on the surge forecasts for your area. The surge usually causes more damage than the winds. What's your elevation? just saw that North Topsail is 0 cm. Need to check that some other friends are on their way outta there. Current forecasts are for a 15-20' surge. This list was compiled by some New Orleans friends. Long, but it's worth reading. No electricity for days on end is no picnic, but if you do some preparation ASAP, you'll at least be glad you did while you're being inconvenienced, at best and having to deal with the worst of it, as well. 1. Go get $300 or more from the ATM - I am not kidding. No cash, no purchase! When electricity is out - so are the registers - and it becomes an instant cash economy. 2. If you have a car, fill it with gas - NOW! Please trust me on this one. If you have a gas can, fill it, too - you will be in a snarl of traffic if you need to leave, that will make you tear your hair out. Also, if you need to use the car to charge a phone, etc, it's good to have extra gas in it, or gas for the generator you neighbor may have and will let you run an extension cord to, because you're cool to have some gas. 4. Water - drinking water and water for the rest of the universe. Bleach out the bathtub, rinse it well, and fill with water to wash dishes, ect. You'll be happy about that later. 5. Get a bucket for the bathroom - it will help with #4 and in the event that other things go terribly wrong (like having to flush the toilets). 8. Battery operated radio - the cell phone and iPod/iPads will give out, once the charge is gone, and some require wireless internet, which will go down with the electricity and you may not be able to recharge them. This is good not only for diversion but for information and should not be underestimated. It's good to stay in touch with the rest of the world. 9. Wind up or battery operated flash light, lantern, a head lamp because holding a flash light gets old. 10. If you have furniture, decorations, etc. on a balconly, or in the yard - I don't care how heavy it is - it will move and could become a flying object. Bring it in the house, plant it in the living room - you will be happy when it doesn't come flying into your house or someone else's house and they sue you. Garbarge cans, too- stick them in the garage and make sure they are as empty as possible before the storm. 11. Get your insurance documents together as well as any property deeds and stick them in a plastic bag. Also have a camera ready and charged to take before pictures of your place and after pictures - and having been through this with other storms/hurricaines - the more you can produce, the better it will go. 12. Don't Panic - but leave absolutely nothing to chance. The storm surge will flood places that you've not seen flooded in your lifetime. If you car gets wet - leave it - you can replace it. You will likely be killed trying to move it because the intensity of that water is insane. If you can park it in a garage somewhere - not underground - then absolutely do that. 16. If you need to make a claim, see #9 above, and know that everyone else in the neighborhood is going to be doing this, too. You may want to call your agent ahead of time and get information on what to do if you need to move limbs and things before they can send an adjuster. 17. If you live in an apartment and have a management company, do not count on them to board your windows, etc. Get plywood and do what you can - without violating your lease. Those of you on the eastern side of the storm are going to bear the brunt of this. It will mean road washouts, major storm surge and blistering winds. Students - take what you value the most when you head home, or go to help your parents. 18. If you live in a low lying area or close to the coast, please consider taking what you really like and leaving for higher ground. Stuff can be replaced, you can't. 19. If you stay in your low lying area, move furniture to the upper floors, take all the pictures and important documents and stick them in ziplock bags - NOT the zippered type, but the type you have to press together to form a good, tight seal! 20. Pur your external hard drive, ipod, and jump drives into a ziploc bag, too, if you plan to leave. When it's raining like crazy, you want that stuff to stay dry. 21. If you are really leaving, empty your fridge and freezer and unplug it. The mess of rotten food will overwhelm you and will stay with you, your house or apartment, forever. 22. Take your pets with you, if you leave, please! They will need to be cared for and deserved to be out of harms way, too! 23. Zip ties, garbage bags, duct tape, purell hand sanitizer, toilet paper, baby wipes, paper towels all come in handy. Paper plates and plastic cups, disposible utensils - you won't want to be washing dishes during the storm and for the time after. These are all things that won't go bad, so buy them now before everyone get in a tizzy. 24. Don't assume that restaurants or other places will re-open quickly. If you have a grill, make sure you have some supplies on hand so that you can cook food that is in your fridge, with no electricity, after the storm as fully passed. 25. Flame wands, those things that are not matches- these are good! 27. Ice. Ice. Ice. Ice. Ice... it's a great thing. 28. A paper list of important phone numbers so that you can call someone from that ancient land line when your cell phone dies and the cordless won't work because of no electricty, or a neighbor's cell phone dies and you can't remember a single number because we have all become so dependant on those silly things. 29. If you are even remotely considering leaving, PLEASE do it before the mandatory evacuation, when everyone else is waiting to leave, too. You know what every day traffic is like, this will only be worse... much worse. If the storm doesn't happen, well, you've been prepared and now you have a clue how to do this... yes, you are ahead of the game, but do not wait for someone to tell you that you must leave. A government official is the last person you want to rely upon for this, just do it! The 19 hours in traffic to go a 100 miles is not worth the grief. ADDED: DO NOT PLUG computers, cell phones, etc directly into a generator - it's considered "dirty" electric. it is best to have a filter on the power from your generator, an inverter is best. The power from a generator fluctuates, so it can overload a computer..
Pay any bills that are due. You may not have postal service or online access for a bit. Some companies may forgive late payments due to long-term outages, some may not. 1)if you have not filled up your car, do it now, pumps don't work w/o electricity. 2)Make sure that you have enough water for a long-term event---1 gallon/person each day. 4) Make sure that you have an old-school can opener. 5) Do your laundry today. 6) Solar powered yard lights can be brought indoors at night for light. 7) Get some cash out of your ATM now. They don't work without power. 13) if you have meat in your freezer, put it in garbage bags now. If power goes out, the rotten meat won't damage your freezer. If you evacuate, empty your freezer and refrigerator. 14) find your most recent grocery receipts. You will be reimbursed for food losses...$3- 400 can add up in lost goods. Of course these tips are in addition to the important tasks that should have already been done such as locating insurance and other important papers, securing photos and keepsakes, taking care of pets and elderly, securing outdoor items, boarding windows, having flashlights and batteries, battery operated fan and radio, etc... most of all, stay diligent, use your brains, and stay safe! My house is at 39 feet. We've gone through a few hurricanes and water never gets close to the house. The streets will be a mess though, lots of water to push out to the river. I'll have to find that and hear what he has to say. The area around Wilmington is pretty low lying. After Floyd, the city was fine but all the roads leading into town were flooded out.